Are you in the process of relocation or struggling to feel settled in and at home? Do you wish you were thriving with ease and confidence, feeling connected faster? Hi! I’m Marni, Relocation Coach. I support and guide people in the process of relocating through an online course and personalized coaching. You’ve been managing the many details and logistics of your move, while possibly caring for the needs of your spouse and/or children, too. You are overwhelmed, perhaps not taking care of yourself very well and may need help connecting to your new place. Through coaching, we will address your specific emotions and challenges together, and develop a personalized strategy so that you thrive through relocation with a lot less stress and connect easily in your new community. Addressing emotions can reduce, or entirely remove, feelings of resentment and relocation depression. Acquiring place attachment, the connection we have to the place where we live, is also a crucial aspect of your relocation success. Our online course, Relocation Recovery, is also a great place to start. Melody Warnick, author of “This Is Where You Belong”, and I collaborated because we share this idea a bit passionately that relocation and learning to love where you live should be a lot easier and fun. I became a Relocation Coach because I want to help you THRIVE through relocation much better than I did. My family relocated twice in less than 3 1/2 years for my husband’s job. Our last move was fairly easy but my emotions, specifically grief, showed up 6 months post move. I was simultaneously excited to be in our new city and grieving the community and place we had left. At the same time when I was struggling, my friends had moved on and weren’t checking in as often. Not because they didn’t care but because they figured by this time I was settling in. I felt stuck and unsure of myself in a new culture. Even though I was on board and happy to be in our new place, the recovery period was long and hard. And it didn’t matter that we had moved previously, that I’ve been moving since the age of 14, each relocation, my reaction, was unique and the last was the hardest. As your Relocation Coach, my priority is YOU and making sure you embrace your relocation and THRIVE. I understand where you are and how you feel. I’ve learned, and strongly believe, that relocation can and should be enjoyable and less stressful. I love being able to support and help others create a positive relocation experience. I love the aha moments that a client has when they find the clarity needed to work through a challenge. I love being an accountability partner in between sessions by text or email. I also love being able to help when the struggles of getting acclimated and being new last longer than expected. If you’re in the process of relocation, or already relocated, I’d love to hear more about you and your journey. For a complimentary session, visit my coaching page. To the relocation professionals and realtors, the experts in this industry, I’d like to ask you a question. HOW CAN I BEST HELP YOU HELP YOUR CLIENTS? I am here to help people thrive from beginning to end, with less pain and more joy, and hope that by helping your clients earlier in the process, this will help you as well. 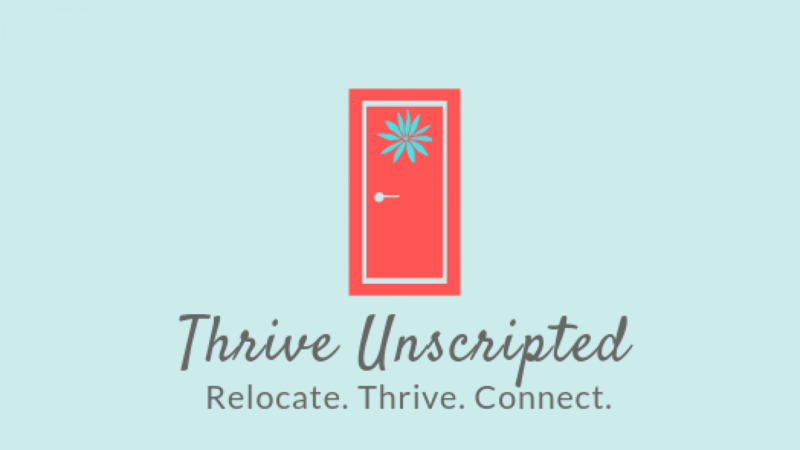 To connect, please email me at marni@thriveunscripted.com, marniunscripted@gmail.com, or fill out the contact form. THRIVE through relocation, on your own unscripted terms.